“Before fluidity, comes learning techniques. It is recommended to take the course in the full length of the 3-week Practitioner Training, but if you are not able to do that due to lack of time, it is possible to divide the intake into: level I-II -10 days, then level III – 5 days. the Practitioner Training has been created with the extra Practice Week (from the original 10-day courses common in Thailand), as believed essential to integrate the amount of information we, in this school, give you during Level I-II. the Certificate of Completion and the possibility to join an Association and get Insurance cover is only reached after completion of also Level III – Practice Week. short of time; already a professional Massage Therapist; a fast and talented learner; or a slow learner, who needs a lot of time for self-practice and to take in information, this 10-day course could be either, exactly right for what you need, or the perfect start. you practice as much as possible once home from level I-II and come back for Level III – Practice week at the first available chance to consolidate under supervision what you have retained. The first two weeks of this training have their foundation in Level I-II courses taught by ITM & the Old medical hospital in Chiang Mai, Thailand. Level I-II provide students with the practical skills to perform the whole Thai Massage sequence in 4 positions: front, side, back and sitting. New information is delivered for the first 4 days, each week. On the 5th day students will practice the sequence learned the previous 4 days in its entirety, to try feel the flow of the moves and focus on the technicalities of the stretches, meridians and pressure points. 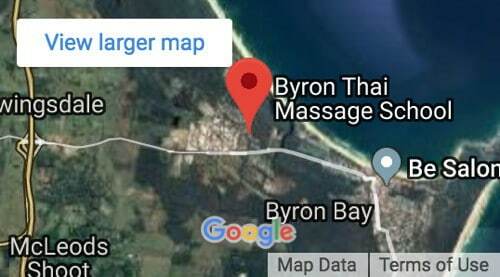 What Byron Thai Massage School offers extra, that is possibly hard to find in Thailand, is a focus on of a correct use of weight, of a proper skeletal position, of the exact direction of pressure, as givers are challenged through complex stretches that require balance, strength and coordination, but also through easy postural alignments, which most people don’t find that easy to hold. Safety and the formation of good habits are Valentina’s priority. On the energetic, mental and emotional planes, the learning experience is supported and completed every morning by an Iyanger YOGA CLASS that follows closely the Thai Massage sequence learned through that day and that is purposely thought of to support and follow each individual in their personal needs. On the first day of the program, students will be introduced to the philosophy of Thai Massage, the working rules, precautions, techniques (using of palms, thumbs, feet, elbows and knees) and correct practitioner’s body positioning. During the first week, students will learn how to move and unblock energy in the body through feet work, energy line work (meridians) of the legs and arms, pressure points and stretches. Special emphasis is on leg work and leg stretches, for the hips and hamstrings and the mobilization of the joints. A simple, but extremely deep and powerful technique for the abdominal work, or internal organ massage, is learned to unlock the energy in the core/Hara of the body. All students will learn to perform a complete massage on the front part of the body (feet to neck). The second week will guide students through the use of reflexology, energy line work, pressure points and stretches on different positions: client laying on the side, back and sitting. Similar techniques are learned on different positions to allow massage on pregnant women, injured, or simply to create variations of treatment. Main acupressure points are introduced for therapeutic treatments. Special emphasis is on the whole back and shoulders, through meridian work and stretches, spinal twists and many different back bends, so to improve flexibility of the whole spine. Pelvis mobilization, hip points, safe quads and psoas stretches and more are all part of this second week. The program closes with the pressure points of the face massage. At the end of the second week, students will have all information to perform a full body Thai Yoga massage of up to 3hrs long. You will need comfy, soft, lightweight clothing such as t-shirts with no buttons and leggings or loose fitting pants with no pockets or side zips. Yoga clothing, Thai fisherman pants and simple t-shirts work well. Please bring to class both a singlet (for when you are working) and a t-shirt or long sleeve top (for when you are receiving). If you own a yoga mat, please bring your own. Sequence manual, workbook, notes and charts will be provided. A DVD of the whole sequence will be provided, so having a laptop with a DVD drive will allow you to watch it during the course. You will need a note pad, colored pens, pencils and highlighters. Bring your own water bottle. Filtered water is supplied. Be aware of what type of jewellery might be appropriate or not and please cut your nails short before the course. YEARLY SCHEDULE : Monday to Friday, 9am to 6pm. Not only did I meet some amazing people, the 3 weeks of learning Thai Massage also became a personal journey for me. The more massages I gave and received the more relaxed and calm I became. I also slowed down my mind, my massages, my breathing and became more accepting of people and situations. I can't wait to get home and practice on family and friends, as with Thai massage both the giver and the receiver seem to benefit, also there appears a bond at the end of the massage. Valentina is an amazingly passionate, caring, kind and thorough teacher who makes everyday fun. Not only did I meet some amazing people, the 3 weeks of learning Thai Massage also became a personal journey for me. The more massages I gave and received the more relaxed and calm I became. I also slowed down my mind, my massages, my breathing and became more accepting of people and situations. I can't wait to get home and practice on family and friends, as with Thai massage both the giver and the receiver seem to benefit, also there appears a bond at the end of the massage. Valentina is an amazingly passionate, caring, kind and thorough teacher who makes everyday fun. I have had such a wonderful 3 weeks doing the course. I did not realize the power of Thai Massage to affect the body in such a gentle, yet profound and deep way. I like the fact that Valentina is very intuitive, in touch with how the moves need to bee done and really good at showing the details of each move. Her vitality and intuitive sense about how we worked made it easy to keep going. I have had such a wonderful 3 weeks doing the course. I did not realize the power of Thai Massage to affect the body in such a gentle, yet profound and deep way. I like the fact that Valentina is very intuitive, in touch with how the moves need to bee done and really good at showing the details of each move. Her vitality and intuitive sense about how we worked made it easy to keep going. I've really enjoyed this course; it's been inspiring and transformative. I've started not really knowing where my hip was and I've come out of it with new awareness about my own body, my health, nutrition, yoga and of course the ability to help an heal others. Valentina is an excellent teacher and is able to make a demanding course great fun! The Yoga classes have been amazing too helping to tone and stretch the body for the massage positions. I would highly recommend this course to anyone as Thai Massage is a lovely set of skills to learn whether or not you want to be a professional. I've really enjoyed this course; it's been inspiring and transformative. I've started not really knowing where my hip was and I've come out of it with new awareness about my own body, my health, nutrition, yoga and of course the ability to help an heal others. Valentina is an excellent teacher and is able to make a demanding course great fun! The Yoga classes have been amazing too helping to tone and stretch the body for the massage positions. I would highly recommend this course to anyone as Thai Massage is a lovely set of skills to learn whether or not you want to be a professional.